Preeclampsia: a pregnancy-specific, multisystem disorder that is characterized by the development of hypertension and proteinuria after 20 weeks of gestation. Preeclampsia can occur anytime within the antepartum, intrapartum, and even postpartum periods. Chronic hypertension: elevated blood pressure that predates the pregnancy, is documented before 20 weeks of gestation, or is present 12 weeks after delivery. 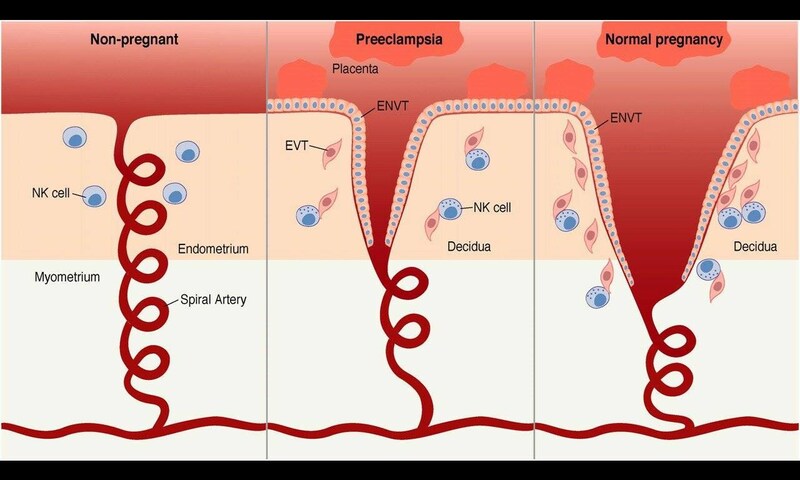 Eclampsia occurs in less than 1% of women with preeclampsia (Witlin 1998). Chronic hypertension at <20 weeks gestational age. In a patient presenting with preeclampsia < 20 weeks gestation, antiphospholipid syndrome or molar pregnancy should be considered (Aronow 2017). Note: Urine dipstick is discouraged for purposes of diagnosis of preeclampsia. However, if use of a dipstick is necessary, 1+ is considered the cutoff for proteinuria.